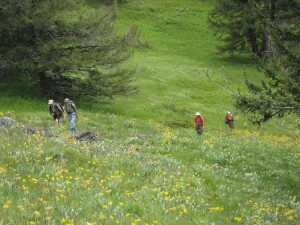 There are three ecological reserves nearby – Soap Lake, Skihist, and Skwaha Lake. The volunteer wardens for the reserves are Gwendy Lamont and Maggie Lord (Soap Lake), Brooke and Ryan Haller (Skihist) and Frances and Alan Vyse (Skwaha). Gwendy, Maggie, Brooke and Ryan joined Senior Ranger Lori Barron and myself for the lunch. The Thompson-Fraser Canyon is a very interesting part of the province and the three ecological reserves represent some of the fascinating and beautiful features in this dry area. Soap Lake is protected for the high alkalinity of the lake and nearby ponds, and the associated unusual vegetation. 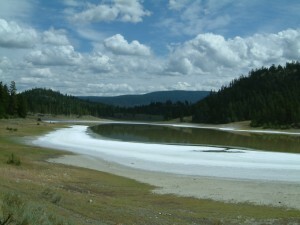 The main lake is very striking, surrounded by a brilliant white salty shoreline. Skihist is a surprisingly undisturbed remnant of Ponderosa Pine-bunchgrass ecosystem. Located only a stone’s throw from the Trans-Canada Highway, this quiet strip of naturalness is protected by the railway on one side and the Thompson River on the other side. In Skwaha Lake reserve, the most striking feature is the subalpine flower meadows amidst the fir and montane spruce forest. 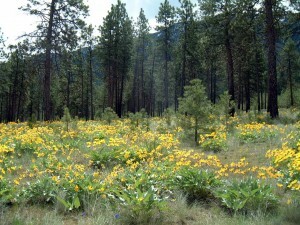 The patches of meadow and forest make a beautiful natural mosaic. There is something in the climate or the stunning landscapes – or maybe in the personalities of the wardens – that causes a high degree of dedication among these volunteers. 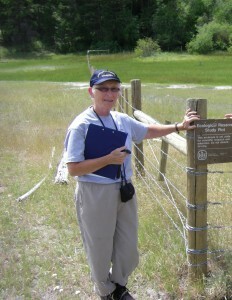 The commitment of Gwendy, Frances and Alan can be counted in decades rather than years, and Brooke and Ryan recently replaced warden Karen Willies who moved to another ecological reserve after 25 years of monitoring Skihist. For more information on becoming an Ecological Reserve Warden, click here. ← ERs in the Path of the Proposed Northern Gateway Pipeline Tanker Route.